Many of our friends are celebrating Diwali, the festival of lights, this week. For those of you not in the know, Diwali signifies the victory of light over darkness, knowledge over ignorance, hope over despair and good over evil. During Diwali, homes are cleaned, people may renovate and festive decorations adorn homes and offices. Dressed in their finest, our friends light candles and lamps and families participate in puja (prayers) to Lakshmi, the goddess of wealth, fortune and prosperity. Feasting and gift exchange are all part of the ritual. Perhaps the symbolism of this celebration is a good metaphor for the notion of taking stock. Broken down in Sanskrit, the word Lakshmi comes from two root words: laks and laksa, meaning to perceive, observe, know and to understand. Hence, to know and understand your goal. A term that’s related is laksana, which translates to target, sign, symbol, aim, quality, lucky mark and an auspicious opportunity. Can you think of a more fitting set of definitions to help focus your attention to your efforts? Become aware and conscious of something that’s either helping or hurting your business and then interpret and recognize what actions need to be put into place to aide in finding nirvana in prosperity. Imperative to not just look at the here and now but be forward looking so as to get ahead of the curve. Gain information by carefully listening and watching. Sounds simple, but the insights will lead to invaluable changes you’ll likely make to surprise and delight your customers, consumers or clients. When was the last time you properly segmented your market? Who is it that you serve and what is it that they need? Be specific! And create products and services that super-serve that audience. Don’t forget the practice of creating ideal customer personas so as to insure you truly understand how best to influence your customer, consumer or client’s decision making. Set the standards of excellence you want to provide for your customer, consumer or client. This is the one attribute you always want to insure is consistent and never falters. “There’s gold in them der hills,” the pan handlers use to say. Mine for those hidden treasures. Lakshmi’s hands are open and laden with gold. Carpe diem! Besides, who could resist bringing a bit of Sanskrit tradition to inspire. 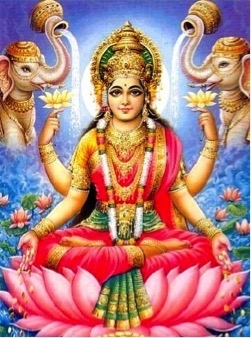 And, from my point of view, who wouldn’t want to be Lakshmi, the goddess of wealth, fortune and prosperity! Think I’ve just found my Halloween costume!